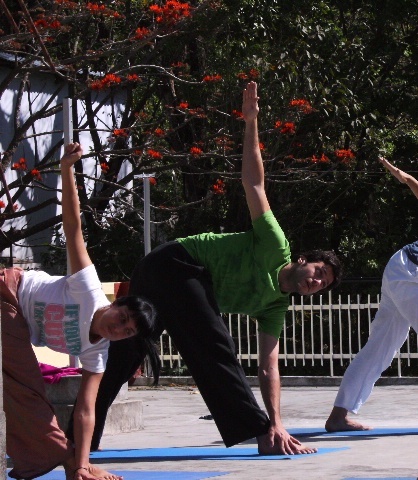 Trikonasana – the triangle early morning yoga on the roof top of the ashram, beautiful sunrise over the Himalaya. Every Yoga teacher is unique. While we all have to undergo the same rigorous training, yoga is a very free flowing expression of the self for both teacher and student. The development of spirit, connecting inwardly and outwardly and what spirituality means. These elements are always very much in balance in all my classes. I like everyone to be happy and walk out of the class feeling good. We are all different. The path of yoga recognises this greatly and I am always aware of this. Lots of variations are given with regard to poses and concise instruction and demonstration is on hand. Roof Top yoga in the Himalaya: My friend Caroline and our beautifully spirited teacher. Yoga is great for stress relief, as it is time for you to experience real quiet time – how often do you get that? The emotional well-being part of the class brings students time to think about all aspects of life from different perspectives, in a calm safe environment, therefore bringing about time to heal from all the different trials and tribulations that life throws at us on a regular basis. Yoga philosophy is my passion. The calming effect and sense of spirit, which my students tell me they get from classes, just keeps them coming back for more. Spirituality is about the inner connection, listening to the higher self (our inner voice and conscience) when we lead from the heart we learn to live more freely…. and without meaning to sound too hippy…… Oh why not, hippy is great, I am a hippy – I’m a yoga teacher… we learn to be more open and life just flows better. We all know the right way, the TRUTH – it’s the things we feel – we just have to stop and listen. When we act, think, and work from a higher place we are working from spirit, from the heart, and this is when life starts to work for us. Both men & women are invited to classes. Many men think it is something that only the ladies do. Yoga was originally created by men and predominately practised by men until the last century. 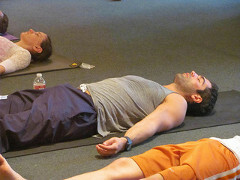 Most of the renowned yogis and authorities on yoga are male. It is great for couples also. I have several couples currently in classes, so if you are in a relationship, what better way of finding a happier way of being together? All I can say is……Just come along and give it a go – anyone can do it, regardless of age, weight, size, gender. I teach in residential and nursing homes – my youngest at heart to date was a 100. I have also taught hundreds of children over the years. You do not need to be flexible to practice the postures – this is the whole point – you achieve greater strength and flexibility over time. Yoga is an amazing, personal path. It has so much to offer!